Thanks to the Corporation for Public Broadcasting and the Soros Documentary Fund for sponsoring Meema Spadola's thoughtful and terrifically important non-fiction look at five families around America in which the parents are out-of-the-closet gays or lesbians. 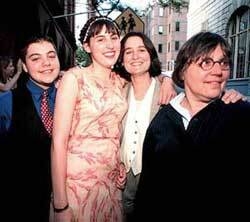 Spadola made splendid choices of which families to concentrate on, as each of the five mini-narratives is keenly dramatic, whether it's a devout Mormon family in Arizona faced with the coming out of the gay father or an African-American lesbian couple in New Jersey bringing up two sons who are being poisoned by their divorced father's homophobia. Though the stories are so varied, summations are in order: (A) Gay and lesbian couples can make wonderful parents, adored by their children, who feel fine with two moms or two pops. (B) However, it can be damned hard to be the children because of the disapproval of their peers. Some kids don't talk to friends about their parents, an Arkansas girl get physically abused at school. (C) Gay and lesbian parents most often have children who are straight, just as does the regular population. However, sometimes gay parents do have a gay child, as in the amusing last tale set in which the butch mother becomes perturbed by her dyke daughter's San Francisco-style supershort haircut.